It’s easy to take for granted the thermostat that runs the heating system in your home. However, a thermostat has a crucial part to play in the operation of a heater, and should it malfunction, it will mean a heating system that won’t turn on, won’t turn off, or provides uncomfortably high or low temperatures. Even if your home’s thermostat is in excellent working condition, you may benefit from upgrading it to a more advanced unit. When you call home heating and cooling specialists to handle thermostat purchase and installation, you’ll receive a quality job that will live up to your expectations. Poor installation of thermostats can result in heating and cooling systems that run inefficiently—or may not run at all. The NATE-certified technicians at Purl’s Sheet Metal & Air Conditioning provide quality installation of thermostats to help achieve better residential heating. If you have an older model thermostat in your home, contact us today to find out more about options for upgrading. Although manual thermostat models are effective at controlling temperatures in a home, they lack the precision of newer digital models. The difference between a manual model and a standard digital model thermostat is small, however: a matter of a degree or two when it comes to temperature settings. The big difference is when you upgrade from either of these two thermostat types to a digital programmable model. A programmable thermostat grants you control over your heating system even when you are not home. You can set the thermostat to turn the heater on a half hour before you return home, which means you can come in the door after a day at work and straight into an already warm house—without needing to waste money running the system throughout the day. This means greater comfort without a sacrifice on your heating bills. There are different levels of complexity for programmable thermostats. Basic models usually have two program slots: one for morning and one for evening. More advanced models can allow different programming for each day of the week, and this will help you enjoy pleasant temperatures and energy-savings without needing to constantly manipulate the thermostat. 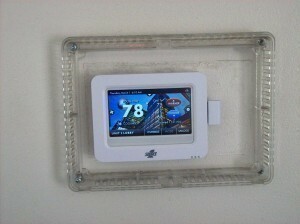 One of new innovations in thermostat technology is the Wi-Fi thermostat. These models allow you to control your heating and cooling remotely with a laptop or mobile device, from anywhere you have an Internet connection. This will help you further reduce energy consumption, and you won’t have to worry about accidentally leaving the heater or air conditioner running when you’re away from home. Call Purl’s Sheet Metal & Air Conditioning if you think your home will benefit from a more up-to-date thermostat. We will help you find the replacement unit that will give you better heating in Fresno, CA as well as increased energy savings. Furnaces are one of the more common ways to provide heat for homes. A properly cared-for furnace can deliver high heating levels and operate for many years with only occasional repair needs. If you have a furnace installed in your home, make sure that you schedule annual maintenance for it during the fall to lower the chance that you will have to call for repairs during the winter. There is no way that you can avoid all repair needs for a furnace, no matter how well you keep the system maintained. Below are some repairs that a furnace may require during its service life to keep it working efficiently, effectively, and safely. If you notice an issue with your furnace—such as a drop in heating levels or strange sounds coming from the cabinet—call for furnace repair service in Fresno from Purl’s Sheet Metal & Air Conditioning. We have 60 years of experience servicing heating systems in the Central Valley. Replacing cracked heat exchangers: The heat exchanger is the component of a furnace responsible for transferring heat from the combustion gas to the air from the blower. If a heat exchanger starts to develop corrosion with age, it may lead to cracks and exhaust gas escaping from the furnace. This is a potentially dangerous situation, and a technician will need to replace the exchanger should it happen. Technicians will notice issues with the heat exchanger during a regular maintenance visit and arrange for the repair work to replace it. Ignition repair: Most modern furnaces no longer use a standing pilot light, but instead ignite the gas jets along the burner using electronic ignition. This ignition can malfunction or fail, which will result in either delayed ignition or the furnace burners not coming on at all. Don’t try to repair this problem on your own: call for professional assistance to repair or replace the electronic ignition. Blower motor repair: The motor that runs the blower can overheat if it develops too much stress on its mechanical parts due to dust, dirt, or lack of lubrication. An overheated motor will burn out and stop working if it doesn’t receive repair work. If you detect airflow issues or discover that the blower will not turn on at all, call for repair technicians right away. Recalibrating the thermostat: Sometimes what seems like a furnace malfunction actually comes from a miscalibrated thermostat that is reading temperatures incorrectly and turning the furnace on and off at incorrect times. Skilled technicians will know how to track down the trouble to the source and fix it. We must emphasize that you should never attempt repairs to a gas furnace on your own because of the potential safety risk. Call on the experienced team at Purl’s Sheet Metal & Air Conditioning for your heating repairs in Fresno, CA. We are on call seven days a week. Before the steady low temperatures of winter arrive, you should know if your heating system has any malfunctions that may impair it or even cause it to break down. The best way to know if you need to schedule repairs is to take the heater for a brief “test run” during a warm day to see if you notice anything wrong. Afterwards, arrange for the heater’s annual maintenance visit from an experienced HVAC service technician. Below are three common repair issues that heating systems may need before winter starts. You can call Purl’s Sheet Metal & Air Conditioning seven days a week to handle any of these troubles, as well as to sign up for our Ultimate Service Agreement to handle maintenance. We are here for all your needs for HVAC repair in Fresno. Gas line problems: You don’t want to turn on a gas furnace at the start of winter and discover that the gas isn’t flowing to the burner. If during your test run on a gas furnace you discovered that the burner wouldn’t ignite, even though the pilot light or electronic ignition was working, than you probably have trouble in the gas line. As with any device hooked up to natural gas, you never want to attempt repairs on your own. Only trust to experienced professionals. Broken ignition/failed pilot light: Everything else in a gas furnace may be operating well, but if the pilot light will not remain on, or the electronic ignition has failed, nothing will happen. Dirt across the burner can cause a pilot light to keep going out, or not come on at all, and electronic igniters can fail for a variety of reasons. Repair technicians can clean off the burner or replace the igniter to restore the furnace’s operation. Low refrigerant: This is an issue with heat pumps, which use the circulation of refrigerant to provide both cooling and heating throughout the year. The refrigerant in the system will not “get used up” during normal operation, but leaking can cause the level of the refrigerant (its “charge”) to begin to drop, which will affect its heating ability and could also lead to serious damage to its components. Because this affects the cooling ability as well, you shouldn’t ignore a dip in air conditioning power from the heat pump during the end of the warm season, since this decline will carry over to heating mode. Professionals will locate the refrigerant leaks, seal them, and recharge the refrigerant to its proper level. During a maintenance visit from one of the experienced technicians at Purl’s Sheet Metal & Air Conditioning, you will learn about any repair troubles your heating system has. We will arrange for the repair work to take care of the malfunction so you will have your heating system ready in time for the winter cold. Trust in us for any repairs in Fresno, CA for your HVAC heating system needs. The fall is one of the best times of the year to schedule heater or furnace replacement. The weather is still warm enough that you won’t need the heater running yet, giving you time to arrange for installation and to find out if the new system has any operational problems. You can also take advantage of this slower period for HVAC professionals to schedule the most convenient time for the installation job. You will be all set with your new heating system before the first cold weather arrives. You should only replace your heater if it’s necessary, however. A few targeted repairs from skilled professionals will often keep a malfunctioning heating system running smoothly for another few years. But you need to pay attention to signs from an aging heater that it is moving past the point where repairs and maintenance will keep it working. If you are unsure about whether you should replace your heater or continue with repairs, call the experts at Purl’s Sheet Metal & Air Conditioning. We have handled heating replacements in Fresno, CA since 1952. Noisy operation: Any strange noise from a heating system, especially a gas-powered heater, needs immediate investigation from skilled technicians to see if it requires repairs. If a heating system constantly makes loud and obtrusive sounds when it runs, then the issue probably runs deeper than what a single repair can handle: the system has worn down to the point that replacing it is the more cost-effective solution. Numerous repairs: If a heating system receives regular maintenance, it helps increase the life span of the heating unit and reduce future repair costs. Most heaters need the majority of their repairs during the last two years of service, so when the repair bills start to pile up, you need to consider heating replacement as an option. Any repair that would cost half the price of replacing the system is too expensive, and replacement is the better option. Corrosion: This applies to gas-powered furnaces, the most common type of heating system. The reaction of combustion gas with metal in a furnace will eventually create corrosion, especially if the unit is having trouble venting adequately. When corrosion begins to appear on a furnace, it indicates that age has caught up with it and you need to install a new furnace. Corrosion is potentially hazardous since it can lead to cracks in the heat exchanger and gas leaks, so do not hesitate to call for professionals when you spot this. Replacing an old heating system is easier than you might think. When you contact Purl’s Sheet Metal & Air Conditioning for heating replacement service in Fresno, CA, you’ll receive the highest quality service from professionals with years in the business. We can handle the work for you, done fast and right the first time.